By Mark - Ecuador - 03 Feb/03 - Viewed 1579 times. After the boat trip we spent five days relaxing in Puerto Ayora waiting for Laura to be able to finish her diving course. Some of the people on our boat stayed on a further 4 days. When they got back we went out for a few drinks to Iguana Rocks. It is a good bar on the road up from the Tortoise roundabout - free pool and musical instruments - but always empty because it is back from the sea front and no-one knows it is there. By the time the diving course was due to start Laura's ear still hurt so we just flew back to Quito. It was nice to sit on the beach and read for a few days but we were looking forward to getting back to the city - even though Isla Santa Cruz is beautiful there is not much to do and all the restaurants are expensive with similar food. There were hardly any tourists about - the locals were saying it was the quietest they have ever seen it. Once back in Quito we bought flights to Costa Rica for the following Tuesday - more than we were hoping at US$348.00 each. The Thursday we got back we took a bus (US$0.45 each) to Mitad Del Mundo (The Middle of the World). 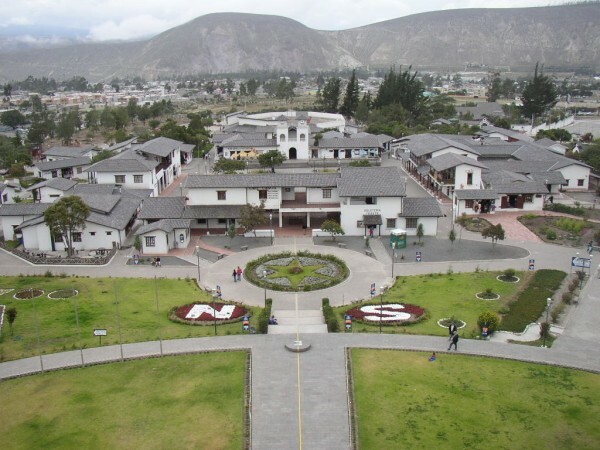 This is a park about an hour north of Quito which stradles the equator. Actually it is 300m south of the equator but it is on the site of a monument built by the French in the 18th Century when they miscalculated where it was. That doesn't stop them having a line painted on the ground pretending to be the equator. It costs US$0.50 to get into the park where there are a few free museums about the equator and the French expedition. It costs US$3.00 extra to go to the top of the monument and see the ethnic museum in it but this isn't really worth it. There is also quite a good minature model of Quito with simulated day and night which costs US$1.00 extra. After that we walked up the road to the museum on the real equator (as verified by GPS). This cost US$2.00 each and was very good value as we had a guide to ourselves to show us round for nearly two hours. She only spoke Spanish but we understood about 75%. The equator is the only place where the sun is ever directly overhead - and then only twice a year for one minute. She showed us water going down the plug hole directly on the equator and it just went straight down. Then she moved the sink one metre north and did it again and it spun anti-clockwise. Finally she moved the sink one metre south of the equator and the water went down clockwise. If only the French had had a sink instead of all those complicated astrological machines they wouldn't have made their mistake. There was another demonstration where she balanced an egg on a nail but I'm not sure this isn't possible anywhere. After we had seen the equator she showed us lots of artifacts from people who lived in Ecuador thousands of years ago. There was also lifesize mockups of their huts and a real shrunken head (They shrank their enemies heads after killing them to stop the spirit getting revenge). It was all very interesting. On Friday we got a bus to Otavalo (US$2.00 each) so we could visit the market the next day. Otavalo was pretty quiet and we had no trouble finding a hotel for US$5.00 each with bathroom and cable TV - called Samay Inn 1. We had one of the best pizzas so far in a place just round the corner where we were the only customers. Saturday was Laura's birthday. We spent a couple of hours wandering round the market without really buying much and then went back to the hotel to watch Southampton v Manchester Utd on the TV. Unfortunately Saints lost. Then back to the market for a bit before getting the bus back to Quito. The market is huge and covers many streets. You can buy just about anything - animals, food, ceramics and of course tourist tat. Nothing you can't get in Quito, but it is worth going to see it. We went out for a very expensive but very good meal at a Thai restaurant on Calames - US$30.00 including drinks which is the most we've ever spent. Sunday we went for a walk to the Old Town. We went to the Banco Central Museum which was very interesting. We decided to save the US$0.50 tram fare and walk back. On the way there is a park where local artists sell their work - we ended up buying two small paintings for US$30.00 so our plan to save money cost us US$29.50 instead. The Old Town itself was mostly closed and there was not much to see. Monday was our last day in South America. We sold our South America guidebook for US$10.00 in Confederate Books, bought a Central America guidebook for US$37.00 and Laura posted all her slide photos home. They only cost US$1.80 each to develop but US$60.00 to send using DHL.